When someone utters the words “…this is the best thing we’ve made…ever!” ’nuff said. 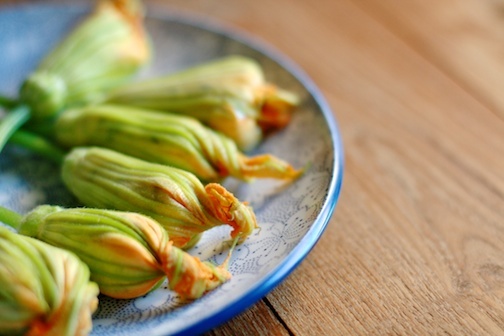 Squash blossoms are available for only a short period of time in the summer and are the epitome of ‘seasonal’. They are typically picked in the morning and brought to the farmer’s market that day and are best used within a couple of hours. This dish is perfectly simple and refreshingly light without being short on flavor. I spotted the original recipe on epicurious as we were walking through the farmer’s market trying to solidify our dinner plans. Our modified recipe is shown below. Besides squash blossoms, in looking for shallots, we stumbled upon green shallots, which I don’t believe I’ve used before. I am positive the dish would have been delightful with regular, good ‘ole shallots…but I believe the green shallots made it just a touch more special! Let’s talk tomatoes! Tomatoes in the summer are serious business. 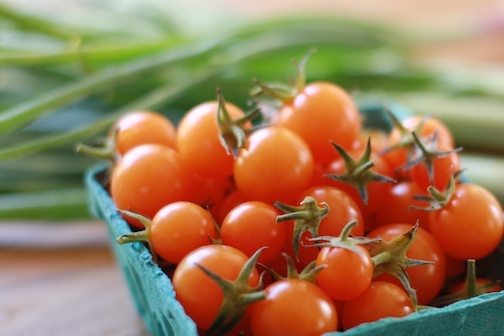 It is not summer without tomatoes that need nothing other than to be plucked from the vine and tossed in one’s mouth and with a tiny squeeze of the jaw burst forth with flavor and juice. These miniature (sometimes referred to as Sweet 100’s) citrusy orange delights would have been so offended had we tried to cook them…they would have sprouted legs and walked right out of the kitchen (original recipe called for roasting the tomatoes). I am often made fun of for appreciating things that come in small proportions (read: I love anything that is small or comes in a miniature size). Prime examples of such behavior: I refuse to use anything other than the mini-taster spoons when eating ice cream from a shop; we shouldn’t even talk about the number of small bowls that crowd my cupboards; and I am addicted to small notepads and mini-books and have recently discovered some half-size mechanical pencils; so my love for baby vegetables should not surprise anyone! How can you resist these little guys!?! Make sure to roast the pepitas, the nuttiness and the crunch are very important for the final dish! Stir together goat cheese, cream, pumpkin seeds, basil, salt, and pepper in a bowl and set aside. Pipe filling into each blossom and twist ends of petals gently to close. We used a ziplock bag and cut off the tip to pipe the filling into the squash blossoms. Chill them covered, until ready to fry. *We realized that we should have made the mixture immediately upon returning from the farmer’s market and filled the blossoms as soon as possible as the flowers were open when we bought them and closed up tighter and tighter as the day went on making it more difficult to fill them later on without ripping the delicate petals. Purée vinegar, shallot, oil, pepper, and salt in a blender until smooth and emulsified. 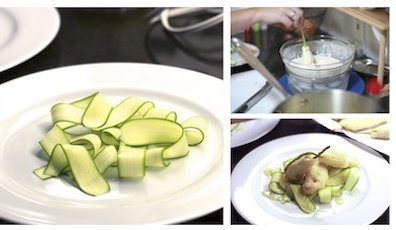 Slice squash paper-thin (lengthwise) using a mandoline, then overlap squash slices decoratively on 2 plates. Do this shortly before frying the blossoms and plating the dish, otherwise the slices will dry out. Heat 2 inches of oil in a 3-quart saucepan to 350°F on thermometer. Set a bowl in a larger bowl of ice and cold water, then whisk together flour and salt in smaller bowl. Then whisk in sparkling water until combined well. Working in batches of 2 or 3, coat blossoms in batter, lifting each out by its stem and letting excess drip off, then fry, turning, until batter is crisp (it will not brown), 1 to 1 1/2 minutes. Transfer blossoms as fried with a slotted spoon to paper towels, drain, then season with salt. Drizzle vinaigrette over squash slices, then arrange 3 fried blossoms in middle of each plate. Sprinkle remaining oven-dried tomatoes, pumpkin seeds, and basil around blossoms and season with salt and pepper. Serve immediately and enjoy with a glass of white wine – we went with a 2008 Russian River Chardonnay. 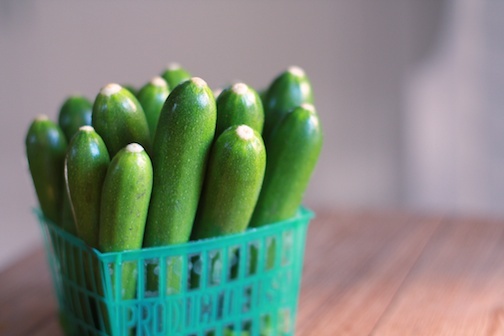 The crisp raw zucchini where perfect paired with the crunch of the tempura and the richness of the goat cheese…add in the juicy tomatoes and the acid from the vinaigrette…and it was perfection! Seriously…perfection! 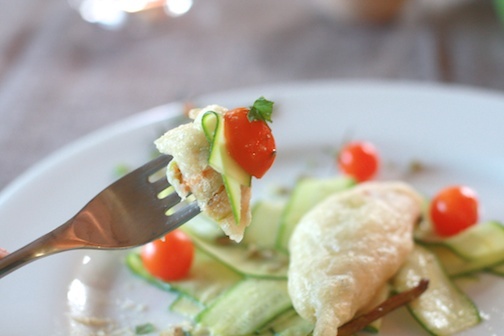 We are dying to make this again…but just might have to wait until squash blossoms are back in season next summer! 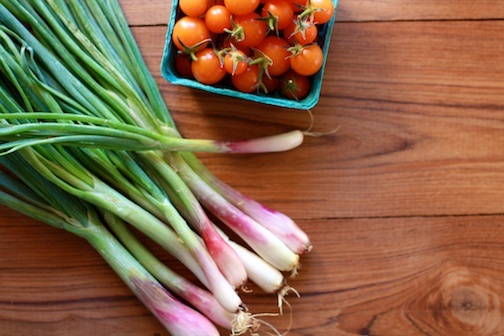 What are your favorite completely seasonal dishes for summer? There is not one thing on this delicious piece of crust that was a disappointment. The crust was great and even better on the next day when it rolled out thinner and crispier!